Transport Tycoon is game where a player has to build his/her own transport kingdom. And that's about the only rule. You start a game as a young and eager entrepreneur (yes, it's an ugly word) with a small loan. You invest your money in transportation infrastructure and services for your world map cities and their industries. The idea is to build well facilitated networks of roads, railroads, airports, and docks that will transport people and goods between cities, in return for revenue that depends on the amount of transported (delivered) goods, the travel time and the distance. As the manager of your firm, you may or may not have to face competition from other AI players, who will vie to defeat you. Sounds boring? Not at all. But wait! If you have idea what game I'm talking about, then you are missing a piece of history. Oh, before you read on, you should definitely refer to my (Open) Transport Tycoon Deluxe article. I used to play this game a lot. And when I say a lot, I mean I used to live Tycoon and play life occasionally. The last time I was able to do it was the day I removed Windows 98 and installed Windows XP. Thus endeth the era of DOS and Tycoon would no longer run. Trying all sorts of Windows tweaks to somehow bring this 16-bit application to breathe in a 32-bit world did not work. Then, one day, the Open Community decided to help me. After months of hard work, the game engine was rebuilt by a Swedish programmer Ludvig Strigeus. 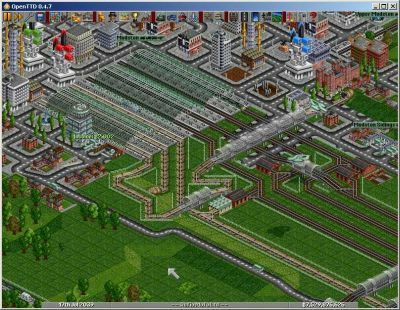 Instead of just making OpenTTD run only on Windows, Ludvig used the cross-platform SDL graphics and sound layer to make the game run on almost any operating system. Not only could the DOS gamers and Windows users enjoy Tycoon once again, it was made available to the Linux, Mac, and even Solaris. The game took off like a storm. Soon, there was a whole community of people involved in bringing this superb little game to life. And I was happy. I could play one of me favorite old timers once again. Today, playing Tycoon cannot be simpler. Unlike Caesar III, for which I had to install VMware Player and Windows XP SP1 in it just to be able to play it, Tycoon requires very minimal effort to be enjoyed. Of course, you still need your original game, because OpenTTD uses the original graphics and music files. What you need to do to play OpenTTD? 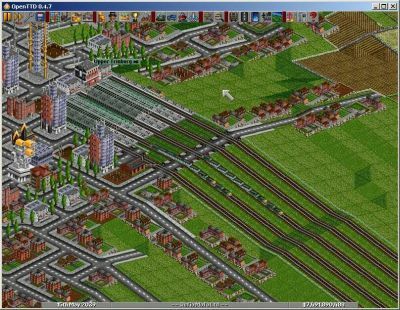 Head to OpenTTD site and download the game that fits your operating system. Find your original Transport Tycoon Deluxe game and copy several files into the data sub-folder (directory). If you have a DOS version of the game - TRG1.GRF, TRGC.GRF, TRGH.GRF, TRGI.GRF, TRGT.GRF. If you have a Windows version of the game - sample.cat, trgl1r.grf, trglcr.grf, trglhr.grf, trglir.grf, trgltr.grf. If you have a Windows version of the game and want music in the game, copy the gm sub-folder (directory) into the game's (OpenTTD) folder. Now, run the game and start building!